This is one of my favorites and I love that strawberries are now 99 cents at Aldi! Can they please stay that price from now to the end of summer?!?! 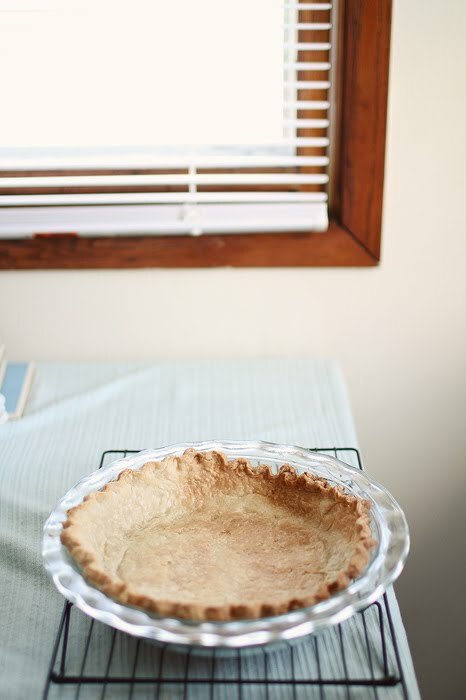 With each pie crust I make, I always think that it will be the one that's going to be picture perfect. 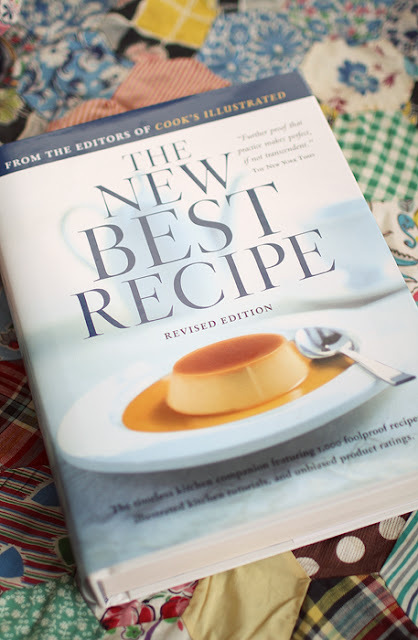 My husband got me The New Best Recipe recently which has become the kitchen bible. Of course, it's always out and I'm reading up on the science behind all 1000+ recipes.... or it's just so big that it doesn't fit in the cabinet with the rest of the cook books ;) It's definitely helping me on my way to pie crust perfection. O.K. 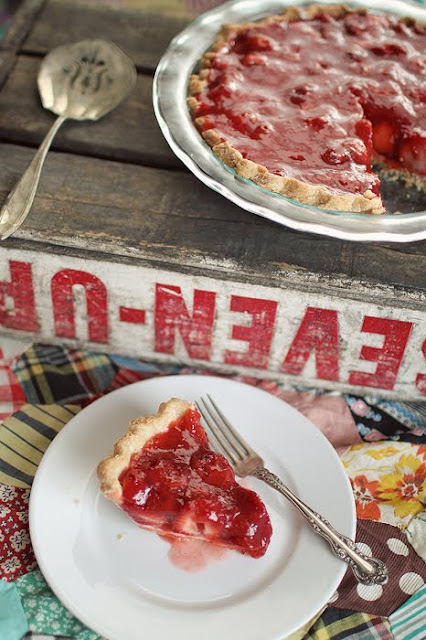 finally on to the recipe so you can savor strawberries all spring and summer! Mash enough strawberries to measure 1 cup. Mix sugar and cornstarch in 2-quart saucepan. 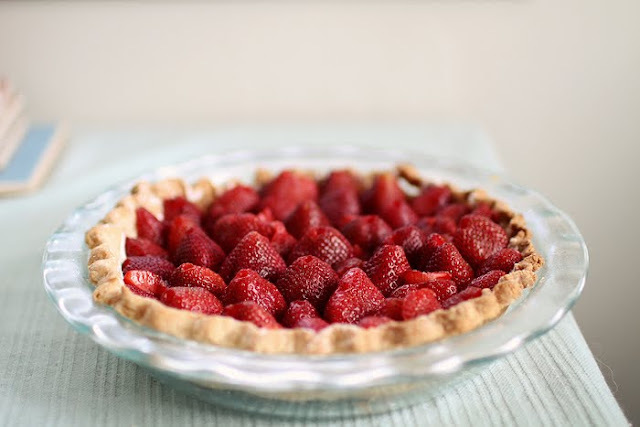 Gradually stir in water and mashed strawberries. Cook over medium heat, stirring constantly until mixture thickens and boils. Boil and stir for 1 minute then cool. 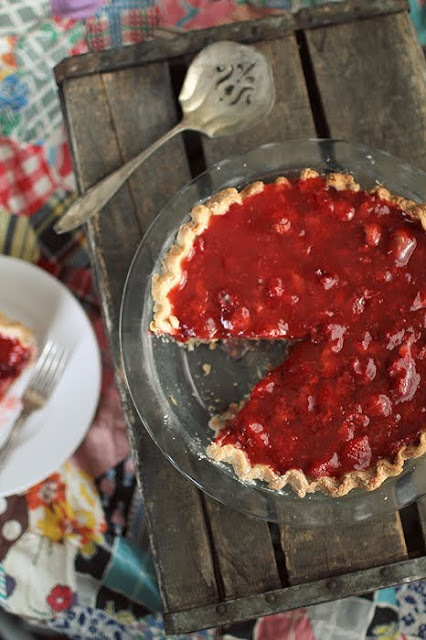 Beat cream cheese until smooth, spread on bottom of pie shell. Fill shell with remaining strawberries, pour cooked strawberry mixture over top. Refrigerate until set, at least 3 hours. Ha now you know the secret of my wood backgrounds in most of my food photos! It's an upside down old Seven-Up crate. 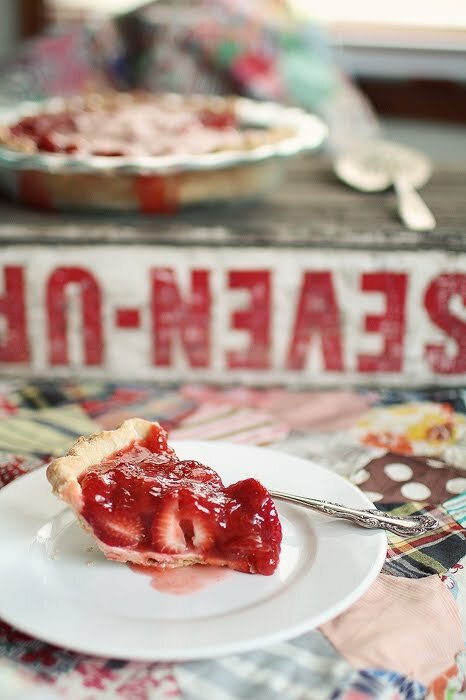 I'd love to know what recipes you want to be making for the rest of your life or your favorite for sharing with friends and family! 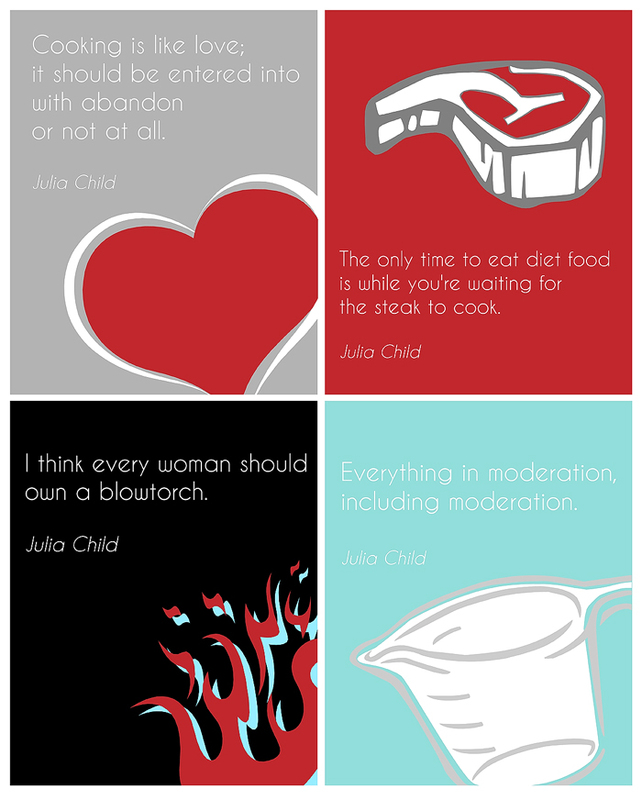 I love me some Julia Child and some of the things she has said crack me up. So here are a couple 8x10 prints with Julia quotes for you to enjoy! Hang them in your kitchen for some cooking and life inspiration. Download from the links below! Mmmm fresh out of the oven! 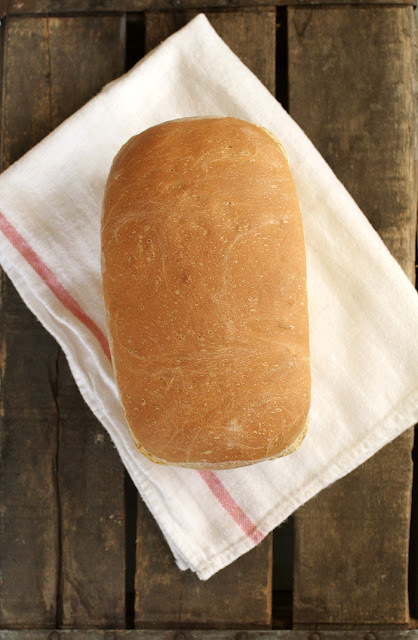 I've been trying to make more bread instead of buying it. I found this recipe and knew it would be the next one to try. Add the rest of the water and 3 1/2 cups of the flour. Stir until well blended. Add the rest of the flour, the salt and butter and stir with the dough hook (or by hand) until well combined and shaggy. Continue to knead (I let the dough hook go for about 8 minutes, poking it down once in awhile) until it’s smooth and elastic. You could do this by hand, too. If you used the dough hook, turn the dough out onto the countertop and knead a few times to make sure it’s evenly smooth. Doesn’t it feel great? Shape it into a ball and put it back into the bowl. Cover with a tea towel and let it sit for 1 – 1 1/2 hours, until it’s doubled in size. 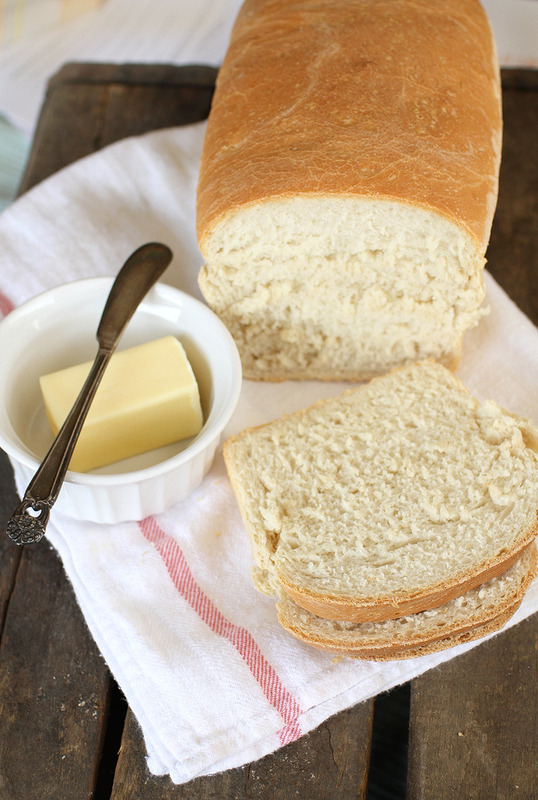 Butter two 4″x8″ loaf pans. Punch the dough down (love that part!) and pat each piece into a rectangle that’s about 9″x12″ – or a bit bigger than a standard piece of paper. Starting at a short end, fold it in thirds, like a letter. Place seam side down in the loaf pans, tucking the ends in. Cover with the tea towel again and leave them for an hour, until they puff right up out of the pan. Preheat the oven to 375°F and put the rack in the middle of the oven. Bake for 30-35 minutes, until the loaves are honey brown. Immediately turn the loaves out of their pans and onto a rack to cool. I think the next bread I'll try is a honey oat bread. It looks and sounds delish!